I do not know much about the composition of steels, only how they perform. I work in a grocery store and have to cut many boxes and a lot of tape. Occasionally I’ll have extra time to just cut massive amounts of cardboard for the hell of it. It is from this background that I have made this decision. First off, none of my blades in VG-10 have rusted. Sometimes I go a week between washing and/or oiling them. They just refuse to rust. I believe Nutnfancy has a video where he stuck an Endura in snow overnight and it didn’t rust. Second is its ability to take an edge. All of my VG-10 blades have come razor sharp and I have been able to get them razor sharp after dulling. I am not the best sharpener. I use a Sharp-maker. No strops, no diamond stones. It does not take long to get it sharp. All of them shave hair in the end. Third is the ability to hold an edge. Lately my main usage has been when I work in the freezer on weekends. Those are usually heavy-use days, compared to when I work cashier and stock shelves (mostly a box cutter). I often go two or three weeks without sharpening my Endura, and it still shaves hair. Last week I cut down a slip sheet into tiny bits. It was about 4’ x 5’ and the Endura was no longer hair shaving sharp afterward, but it was still cutting. Fourth is the price point. This is where it really shines. You can find the above qualities in plenty of other steels, but many are more expensive and out of reach for some people. An Endura has a 3.75 inch blade. An S30V blade of comparable length will probably cost you about $75 and goes up from there with other steels [Ed: tell me about it; I just picked up an S30V Spyderco] but the Endura can be had for a mere $60, often times less. And that is where the steel shines. The price point of VG-10 knives has made me question why I’d buy higher end knives, but I cave in sometimes. I like plenty of other steels, but for the reasons above, VG-10 is the best in my opinion. My first locking knife was an Endura v1. Currently I have a Delica but another Endura is definitely on my short list; actually two, 1 FFG and 1 Saber. Stupid bills keep getting in the way. I’m not going to say how many years of experience I have using knives (rapidly approaching OFWG status), but I can definitely back up the author’s experience with VG10, as executed by Spyderco. I’m actually not too particular when it comes to blade steel, since I clean and sharpen my knives frequently anyway, but I do find VG10 to sharpen easily, and take a very fine edge, which places it near the top of my list for working knife steels, along with Buck’s 420 HC, Cold Steel’s AUS 8, and Kershaw’s 14C28N. That said, I own a Spyderco Carbon Sage1 in CPM-S30V and that one has gone even longer without ever having to sharpen it, just stropped. Price point is in favor of VG-10 though. Talked me into it. Got one coming; should be tomorrow. Slices paper really well. Doesn’t shave hair. Essentially the same size as my old Benchmade Eclipse, but noticeably heavier. Really grippy handle. The grind lines are more noticeable on the left side than the right, but nearly smooth near the tip on the left. 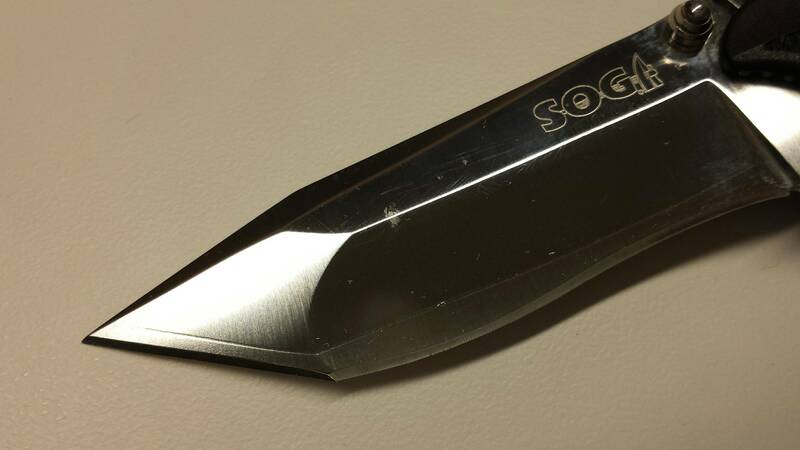 I lost my SOG Vulcan with VG10 blade two years ago this month…then found it under my car seat this past Saturday – lol Apparently in the safe bosom beneath my car seat, rust can find its way to your knife blade. Yes, my VG10 blade had a few bits of rust on it, but it wasn’t horrible. The rust that did sink its teeth in did make some pitting. I’ll provide a photo so you can see for yourself. So yes, just like any other ferrous metal, VG10 can and does rust, so keep it clean and oiled. 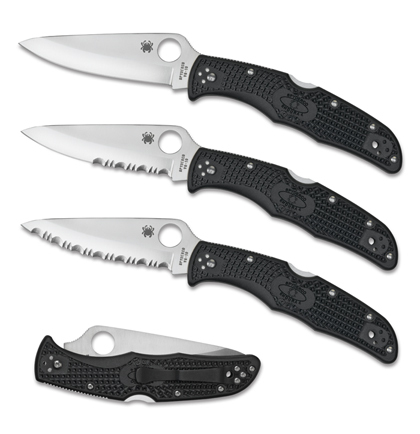 It looks like 2 out of 3 of the blades in the photo are serrated – what sharpener do you use for them? Obviously a regular bench stone wouldn’t work; do you have any recommendations for keeping a serrated edge sharp? I have been looking at this Diafold serrated blade sharpener but I would prefer a recommendation from someone who actively uses serrated blades. I have always used a SPyderco Sharpmaker for my serrated blades (for about 15 years). I don’t have experience with the diafold. Looks interesting. I use my EDC for maintaining the tip on my pool cue. I really dislike a tip that has mushroomed over the ferrule, even a little bit. I use tough laminated leather tips from several makers. I have used Vg-10, s30v and d2 blades. By far, my favorite is a Camillus 18669 VG-10. Whenever you trim a tip, you must work away from the ferrule, risking pulling the tip off. Therefore the edge must be extremely fine. While I do have to resharpen this blade more often, it takes an excellent edge for my application. It slides through tough, laminated leather like nothing. I grind it under 15 degrees and it performs well. I must say the blade profile on this blade is ideal for my application which may be an unfair advantage. “And it doesn’t even rust”? Why WOULD it rust? Unless you leave it on the damp ground for a week, or use it near salt water and neglect oiling it, it won’t rust. It’s a form of stainless steel, not carbon steel. Sure, what you said is true, but that’s like praising 420 for not rusting. It would be unusual if it DID. It’s being used often, it’s not being subjected to constant humidity or salt, and the oils from your skin and other things you cut ought to be more than enough to protect it from rusting. That said, of you work in a grocery and use a Spyderco to cut up boxes, the only reason is that you think you are too cool to use a box-cutter and/or you are looking for excuses to use/show-off your knife. Using a knife to cut a few boxes on occasion is one thing. When your job description is cutting and opening boxes and your refuse to use the tool designed for it, that’s another. Box-cutters were invented for a reason, and they are a far more efficient and much safer tool for the job than your $60 pocket-knife. I’m very surprised they even allow you to use a pocket knife; most stores would freak out instantly over the liability aspects of it, and would at least warn you, if not give you official censure.